The cough assist helps to clear secretions by applying a positive pressure to fill the lungs, then quickly switching to a negative pressure to produce a high expiratory flow rate and simulate a cough. It is known as ‘manual insufflation-exsufflation’ and can be applied via a mask, mouthpiece, endotracheal or tracheostomy tube. It is most useful in patients with an ineffective cough due to muscle weakness, in conditions such as muscular dystrophies, myasthenia gravis, SMA, Spinal cord lesions, MND etc. In conditions such as spinal cord injury or neuromuscular disease an individual may require assistance to cough using manual techniques or a medical device. Manual assisted cough is the compression of the diaphragm by another person to replace the work of abdominal muscles in order to facilitate a cough. 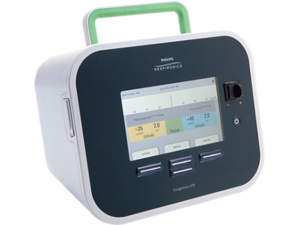 A medical device can be used to assist coughing effort by a positive pressure breath followed by a rapid change to negative pressure. Inspiratory pressure matches the Expiratory pressure when the INHALE PRESSURE dial is turned to the far right. The cough assist can be used in Automatic or Manual modes. Carry out any chest physio techniques prior to cough assist to optimise treatment and position patient as indicated. Explain procedure and accustom patient to mask with machine off. Oxygen can be entrained via nasal specs or t-piece if needed. ↑ Bach JR. Mechanical insufflation/exsufflation: has it come of age? A commentary. Eur Respir J. 2003;21:385-386. ↑ Finder JD, Birnkrant D, Farber CJ, et al. Respiratory care of the patient with Duchenne muscular dystrophy: ATS consensus statement. Am J Respir Crit Care Med. 2004;170:456-465. ↑ Chatwin M, Ross E, Hart N, Nickol AH, Polkey MI, Simonds AK. Cough augmentation with mechanical insufflation/exsufflation in patients with neuromuscular weakness. Eur Respir J. 2003;21:502-508. ↑ Sancho J, Servera E, Vergara P, Marin J. Mechanical insufflation-exsufflation vs tracheal suctioning via tracheostomy tubes for patients with amyotrophic lateral sclerosis. Am J Phys Med Rehabil 2003;82(10750-753. ↑ Vianello A, Corrado A, Arcaro G, Gallan F, Ori C, Minuzzo M, Bevilacqua M. Mechanical insufflation-exsufflation improves outcomes for neuromuscular disease in patients with respiratory tract infections. Am J Phys Med Rehabil 2005;84:83-88. ↑ Garstang SV, Kirshblum SC, Wood KE. Patient preference for in-exsufflation for secretion management with spinal cord injury. J Spinal Cord Med 2000;23(2)80-85. ↑ 9.0 9.1 9.2 Harden, B. (2004). Emergency physiotherapy: An on-call survival guide. 1st ed. Edinburgh: Churchill Livingstone. ↑ Tzeng AC, Bach JR. Prevention of pulmonary morbidity for patients with neuromuscular disease. Chest. 2000;118:1390-1396. ↑ Miske LJ, Hickey EM, Kolb SM, Weiner DJ, Panitch HB. Use of the mechanical in-exsufflator in pediatric patients with neuromuscular disease and impaired cough. Chest. 2004;125:1406-1412.